I am Avanish singh a dairy technologist have 15 year work experience in dairy industry and since 2014 do our dairy business currently we collect 10000 liter good quality milk and sale to powder plants. Now i want start my own milk and milk processing plant and required Funding for my project. Project report is ready . Hello I am Avanish Singh a dairy technologist complete my three year diploma in dairy industry in 2002 and take work experience of 12 year in dairy industry and since 2014 I doing my own dairy business .I started my job as a technical officer and leave my job from General Manager Position. Demonstrated excellent trouble shooting capabilities while upgrading many low profits making dairy plants in to financially viable units by implementing turn around plans. Proven ability in project planning, economical execution and timely commissioning for minimizing project implementation costs. Application of effective customer oriented marketing and advertisement strategies, produced exceptionally good results. Excellent business management skills demonstrated in terms of maximum profits, productivity and quality of dairy products. All round organizational skills well applied to create new performance records in key result areas. I start my proprietorship firm Gomti dairy in 2012 with capacity of 2000 liter milk procurement per day and now I collect 10000 liter fresh milk per day from farmers and vendors and sale to powder plant in very good margin.Now I want to expend my business with good ideas where I can generate good revenue for my firm. (1) I want expend my Milk collection 10000 to 50000 liter per day in 2017-2018 financial year. (2) I want setup own milk processing plant with 10000 liter capacity per day where i make many value-added dairy products like fresh milk,paneer,curd,ghee,lassi,khoa and traditional local sweets. How we produce more revenue from my business it’s not execute by any other dairy company all dairy company adopt old pattern but what I want to do it is not difficult. (1) I collect milk from direct farmers so i appoint a agent in each vlcc(village level milk collection center) in other dairy company vlcc agent purchase milk only but in village farmers produce many other product like potato, wheat ,paddy, onion, etc and want to sale but due to broker pattern farmers don't want more production but if I sale farmers products direct or with tie-up with good company like ITC, patanjali, dobar, etc so my vlcc agent purchase all things whose farmer produce in village and sale it with good margin. (2) All vlcc agent of other dairy company only purchase milk but our vlcc agent sale our products and many other products, in village huge demand of paneer, Chena, khoa, ghee and sweets in marriage seasons, and also sale cattle feeds, animals medicine, and other dairy farming related products and equipments. From adopt this method of procurement we can generate good revenue make good relation with our farmers and no any competitor beat us in future. (3) I want to start a microfinance company or tie-up with any good microfinance company in future and company give group loan to our farmers for cattle and agriculture and we pay to farmers for his milk and other product after deduction of our loan premium and interest. I have good ideas in sale also we don't want take old path of sales and distribution where milk company appoint distributor for sale his product but due to distributor fraud many company fall in loss and close his plant also. I want to start our milk processing with small scale only 10000 liter per day and start our product sale direct to consumer if we make only 2500 good consumer in my city Varanasi they purchase all my milk and milk product easily. In Varanasi all company come for sale his milk and milk products from 400 kilometer so Varanasi consumers seeking for a fresh milk from his city who can available fresh milk and milk products. In my project report I submit only for Varanasi city plant but in next 5 year we can install and many milk plants in other city plant capacity will be depend on city market capabilities. Like we can install same like Varanasi plan in Gorakhpur and Renukote and 5000 liter per day milk processing plant in Jaunpur, Azamgarh, Ballia and many other district. And can sale our all procure 50000 liter in milk and milk product form. Now we want to sale 10000 liter milk and milk products in Varanasi and other 40000 liter in milk powder plants its plant located in Uttar Pradesh, Bihar, Jharkhand, and in Nepal. where we take good profit we sale our milk and generate good revenue from milk trading business because all milk powder plant searching for good venders who can supply good quality milk I have many contacts in milk powder plants so no any problem for sale our milk in good marginal rate. To become leaders in the Indian Dairy Industry, while retaining our Indian traditions and family values. Be the first choice for consumers, Across the Purvanchal we want our consumers & Milk Powder Plants to think 'Gomti' First when they think of Milk & Milk products. Give our customers value for money. This will be through improvement in technologies used in our Dairy, thus enhancing the quality of our raw material, our internal processes, and the competency of our people. Productivity enhancement of animals through genetic development programs whereby the farmers too will be benefited. Provide our customers with the cleanest and healthiest milk, for which the focus on nutrition starts from the animals themselves, thus leading to more nutritional milk and milk products. From farming to Pharma … Broaden the natural functional applications of milk and milk products, by targeting medicinal, organoleptic, and other pharmaceutical and therapeutical functional values. Seamless flow of data from the plant floor to the board room, facilitating informed and immediate decision making. Transformation of this data into useful domain knowledge, and sharing the domain knowledge obtained back with the plant floor, for employee development. Preserve and showcase our agricultural heritage, and protect local economic interests including the development and education of our rural communities. Be a preferred employer in our field, and provide an environment that challenges our employees to learn, grow and prosper in an atmosphere of respect and recognition. Our employees will be proud to be a part of the Gomti family. Project will improve socio-economic status of large numbers of dairy farmer families. Project will provide safe and high quality dairy products to urban consumers. Project would contribute immensely in improving peace and prosperity. Paneer, Dahi and Milk powder in different fields like product developments, production and projects. Apart from these I also have worked for implementation of ISO-22000-2005 and HACCP in Paras Dairy for above mentioned products. I also have done major role in commissioning of Polypack plant in Kautuki Dairy and Powder plant in Paras Dairy. My Goal is to work on dairy field and in all streams, and find a combination which can make economic product with high nutritional benefits with better adaptability in market. Currently manage Gomti dairy in Milk collection and manufacturing facility located in Varanasi, plant manufactures Paneer and Chena. Working on project Milk Procurement set up for a capacity up to 50 thousand liter per day in phases in Varanasi and its adjoining areas. Survey for Fresh Liquid milk marketing and related Culture Products like Chach, Dahi in Varanasi and its adjoining areas. The Kautuki Dairy was managed on behalf of Managing Directors. Kautuki is a 60,000 liter per day capacity multi-product dairy plant including Liquid milk, butter and indigenous milk products like ghee, Dahi, lassi, chach and paneer. Served as overall Incharge of milk procurement, processing, quality control, marketing, purchase, engineering and all other related departments of the whole system. Special preventive maintenance systems were developed. A new product, Paneer, was developed and its commercial production was started on a large scale. The aim was to manage all the activities of the system to put the Project as a Profit Making Centre. This was achieved in the very first year of operation. MSoffice, MSword, MS excels. Page maker, Photo shop, Scanning, Internet, Power point etc. accounts for 57.3% of the world’s buffalo population and 14.7% of the cattle population. As per 18thLivestock Census, 2007 the country has 33.06 million cross bred cattle, 199.07 million indigenous cattle and105.34 million buffaloes. The cross bred cattle are predominant in Tamil Nadu, Maharashtra, West Bengal, Karnataka, Andhra Pradesh, Uttar Pradesh and Bihar, While buffaloes are very common in Uttar Pradesh, Rajasthan, Andhra Pradesh, Madhya Pradesh, Gujarat, Punjab, Haryana and Bihar. 1.3 There has been a major improvement in milk production, which increased from 17 million tonnes in 1951 to 127.9 million tonnes during 2011-12. Uttar Pradesh, Punjab, Madhya Pradesh, Rajasthan, Maharashtra, Gujarat, Andhra Pradesh, Haryana, Tamil Nadu and Bihar contributed to the extent of 80 percent of the total milk production in the country. The per capita availability of the milk has reached a level of 290 grams per day during the year 2011-12, which is more than the world average of 284 grams per day. Most of the milk in the country is produced by small, marginal farmers and landless laborers. 1.4 Recognizing the importance of the sector, several key initiatives were taken by the Govt. in the past ranging from Operation Flood (OF) programme, Intensive Dairy Development Programme (IDDP), Strengthening infrastructure for Clean Milk Production, Assistance to Cooperatives, Venture Capital Fund (VCF) for Dairy, Dairy Entrepreneurship Development Scheme etc. 1.5 In order to meet the rapidly growing demand for milk with a focus to improve milch animal productivity and increase milk production, the Government has approved National Dairy Plan Phase-I (NDP-I) in February, 2012 with a total investment of about Rs.2242 crore to be implemented from 2011-12 to 2016-17. 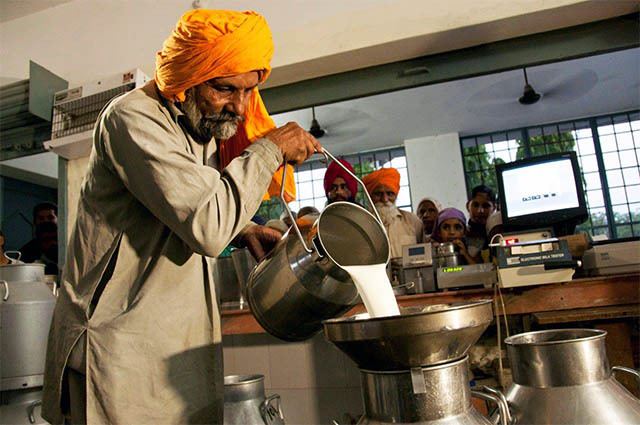 NDP-I will help to meet the projected national demand of 150 million tons of milk by 2016-17 from domestic production through productivity enhancement, strengthening and expanding village level infrastructure for milk procurement and provide producers with greater access to markets. NDP-I would focus on14 major milk producing States - Uttar Pradesh, Punjab, Haryana, Gujarat, Rajasthan, Madhya Pradesh, Bihar, West Bengal, Maharashtra, Karnataka, Tamil Nadu, Andhra Pradesh, Orissa and Kerala which account for over 90% of the country’s milk production. Coverage of NDP- I will however be across the country in terms of benefits accruing from the scheme. 1.6 Department of Animal Husbandry, Dairying & Fisheries, Ministry of Agriculture, Government of India is also implementing “National Programme on Bovine Breeding & Dairy Development (NPBBDD) from 2013-14 to 2016-17 through the State Implementing Agencies / End Implementing Agencies / Participating Agencies (Source: http://dahd.nic.in). Rajanish kumar singh is young and dynamic personality he had 7 year experience in the field of milk procurement and sale he is already engaged in the milk sale with support of Mr Avanish Singh who is having his diploma in Dairy. The organized dairy sector (both cooperatives and private) is presently handles about 15 percent of total milk production in the country. Thus it indicates, there is a wide scope for processing of milk and manufacture of milk products for domestic consumption as well as export. The financial assistance is extended for processing of milk with the following objectives. iv) To provide quality products at affordable prices to the consumers. It involves procurement of milk from the villages, chilling, standardization, homogenization, pasteurization, packing of market milks of various kinds (whole, standardised, toned and double toned milk) as well as manufacture of milk products. India is leading in production of milk and dairy is one of the major subsidiary activities of most of the farmers. Despite of highest production in the world there is always a demand supply miss match for milk and milk products. The demand for milk and milk products is at its peak during festive occasions like Diwali, Id, Holi, etc. In order to meet the demand during its peak, the milk needs to be converted to various milk products due to its perishable nature. But there is lack of processing infrastructure in the country. Therefore, there is good scope for financing milk processing activities in entire country. The principal raw material is milk. The extent of milk procurement area, milch animal population, average milk yield, percentage of animals in milk, marketed surplus etc. will determine the size of the plant. The method of procurement, transportation of milk and input supply to the farmers is required to be highlighted. The availability of other inputs such as packing materials, disinfectants and consumables should be ascertained. generators may be considered for connecting the essential sections. A milk processing plant requires the water in the ratio of 2:1 (2 liters of water for 1 liter of milk processed) for cleaning of equipments, cold storage and drinking purposes (source of water supply, quantity available and suitability for the purpose has to be mentioned). Accordingly, the size of the well is required to be designed and depends on the quality of water, the water softening plant may be considered. The steam requirement (kg/hr) depends upon the processes involved and the source of steam may be met by coal/oil/gas fired / electric boiler. The fuel is need for various processing operations. The type of fuel will depend upon the type of boiler used for steam generation. It is therefore necessary to assess the requirement of LDO/coal/gas and also ascertain the easy availability before purchase of boiler. It will be required for various pneumatic operations flow control operations as well as for cleaning purposes. The total requirement of compressed air and the capacity of the compressors are required to be furnished. The vehicles required for procurement and distribution of milk depends on the quantity of milk to be handled. The number of vehicles required, source of supply, rental charges etc. need to be furnished. Depending upon the need, the requirement of vehicles may be considered in the project cost. Generally, insulated vehicles will be required to transport chilled milk and reefer vans for transport of finished products like ice cream, cheese, etc. A maintenance workshop is an integral part of milk processing for carrying out repairs and maintenance of equipment. Key Managerial Person: - Younger brother of promoter Mr Avanish Singh is having 10 year experience in milk industries he has done his engineering Dairy management. The process involved is milk pasteurization and processing of milk into toned milk and products such as cream and ghee. The effluent will be in the form of washed water and milk solids apart from the detergents and sanitizers used in the plant. There are no hazardous effluents generated from a milk processing plant. However, construction of effluent treatment plant is necessary for treating the effluents before discharging for proper disposal. to get clearance from them. The treated water can be utilised for irrigation or creating a biotic zone where plants can be grown in and around the dairy plant. With rapid growth in population providing food security has taken the Govt. as well as planners in a quandary. The availability of land being limited, increased production in agriculture front has become a matter of concern for every Government. It cannot be gainsaid that, agriculture production alone can meet the demand of human population. In this context production through poultry sector has become centre stage as a means of alternative source of protein. Poultry egg and meat are important sources of high quality proteins, minerals and vitamins to balance the human diet. Specially developed breeds of egg type chicken are now available with an ability of quick growth and high feed conversion efficiency. Depending on the farm-size, layer (for eggs) farming can be main source of family income or can provide subsidiary income and gainful employment to farmers throughout the year. Poultry manure has high fertilizer value and can be used for increasing yield of all crops. Egg are vital source of providing high quality of animal proteins, having excellent source of iron, phosphorous, selenium and other minerals which are daily requirement of the human body. Animal Protein is more valuable than that of plant protein per capita consumption of eggs in many countries is far below the minimum recommended level. Currently India ranks fifth in the production of eggs in the world but there is still a great scope for increasing the production of eggs. The per capita availability of eggs is 33 whereas it should be 182 eggs per person as per ICMR recommendations. There is a scope for increasing the egg production to about six times of the present level. 30000 layers are viable economic size to start and environmental controlled layers farm, where the operation and fixed cost are justifiable because below 30000 layers means to increase the production of cost while the fixed cost remain same. A controlled environmental layer from with a population of 30000 layers started in pre fabricated building shed requires total investment estimated at Rs. 182.44 million. This project is proposed to start on 40 percent equity and 60 percentages debts. Projected IRR, and pay back of proposed pre-feasibility study are 46.86% Rs. and 3.77 years collectively. The major products and by-products proposed to be manufactured along with quantities, composition in terms of fat and SNF and costing should be indicated. The market for the product (domestic and export), type of arrangements for distribution and sales, commission and additional incentive to be given, the proposed network and the advertisement plans should be furnished. Detailed market survey report is required to be submitted.In the present model, the product range proposed includes toned milk,cream and ghee. The proportion of these products (product mix) needs to be decided as per the market requirements and it can be varied depending upon market situation and lean and flush seasons. It involves the present demand-supply for various products, gap in supply and expected demand for various products. The major competitors and their present share are to be ascertained. The company projections for the next 3-5 years and the basis for projection may have to be furnished. The product wise quantities and countries where it is to be exported need to be mentioned. Broadly the capital cost includes the cost of land, development of land, fencing, internal roads, civil works (Plant building, office, quarters etc. ), plant and machinery, preliminary and preoperative expenses, margin money for working capital, etc. The project cost of 10000 LPD model milk processing plant is given below. The above costs and the plant and machinery details given at 8.4 are indicative and the actuals have to be arrived at based on the location specific designs, estimates and quotations. Working capital is the most crucial input for viability of any milk processing unit. Nowadays, banks are free to finance working capital based on actual need of the borrower. A provision of adequate working capital needs to be considered by the financing banks. The banks provide Cash Credit Limit, commonly known as CC limit to the borrowers for meeting their day to day expenses. The different components of working capital are work-in-process, finished goods, sundry debtors and sundry creditors. The assessment of working capital is presented in Annexure X. Financing to food processing falls under priority sector lending. The loans to units meeting the criteria of MSME are classified under MSME sector. Such units can be financed by any scheduled commercial banks, Regional Rural Banks and Cooperative Banks. Important terms and conditions of financing such units are discussed in this section. The entrepreneur has decided it plant location at plant location will be Danganj Varanasi because Danganj located in center of four district Varanasi Jaunpur Azamgarh and Gazipur were we sale our products and milk availability is better in nearest village, which is central place for input material availability and finished goods sale. The site is situated near State Highway ensuring no transportation bottleneck. The entrepreneur is having vast experience in business and having good relationship with various Government Departments and Industry partners. The entrepreneur is in position to install & run the proposed Industry efficiently and thus will be able to increase overall profitability of group and also develop the social status of locality. Your share could be as good as a donation for Gomti Dairy! Not everyone can afford to take care of their loved ones. Gomti Dairy's life can only be saved by donations made by kind people like you.